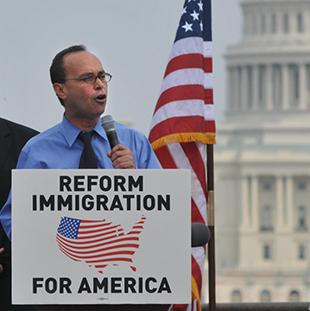 U.S. Rep. Luis Gutierrez, an immigration advocate, does not support the STEM Act. You may have noticed that post-election the GOP seems to be going out its the way to recast itself with Latinos, particularly around immigration issues. But the keyword here is seems. Last Friday, the Republican-controlled House of Representatives passed the STEM Act, a bill designed to facilitate U.S. visas for foreign nationals studying science, technology, engineering and math at American universities. With these visas, such students could stay in the U.S. after graduating, rather than go home and begin the process of coming back alongside everyone else who wants to come here. GOP Majority Leader Eric Cantor told USA Today said that such a visa program is needed to help grow the U.S. economy, because immigrants are currently awarded the majority of U.S. patents in STEM fields; a quarter of all STEM businesses, he said, were created by immigrants. But here’s the part of the bill Republicans aren’t talking about: The STEM Act kills the Diversity Visa Program, better known as the green card lottery, essentially by replacing it. As proposed by the GOP, the STEM Act would take over all 55,000 slots for worldwide visas. But, precisely because the STEM visas require specialization, it would likely give out closer to 30,000 visas at most, but probably considerably less. There simply aren&apos;t that many qualified people to fill those slots. In other words, the STEM act would in effect cut immigration to the U.S.
About 80 percent of visas are distributed in Europe and Africa; about half the people who currently come to the U.S. legally through the green card lottery are from Africa. But green card lottery winners come from everywhere and always have. The lottery is designed that way: Visas are distributed on a regional basis, with regions that have sent fewer immigrants to the U.S. in the previous five years receiving the most visas; no single country can receive more than seven percent of the total number of visas. But the STEM Act does away with regional balance: It would look strictly at individual qualifications, meaning that places such as Africa and Latin America would probably have very few slots, while China and Southeast Asia would likely become the biggest providers of visa-holders. The bill isn&apos;t likely to make it past the Senate, and last Thursday, Democrat U.S. Rep. Luis Gutierrez took to the floor of the House to decry the Republican effort. In case you’re wondering if the lottery is a thinly disguised amnesty program for undocumented immigrants, this is what it says on the program FAQ page: “If you are undocumented and you receive a notice . . . that you have won the DV lottery, the notice will instruct you to return to your country for processing. If you follow these instructions and leave the U.S., you will almost certainly not be allowed to return to the U.S."
Who came up with this dastardly program? George H.W. Bush, the last Republican moderate, back in 1990.